The Millennium Futurity and Sale promotingTexas Longhorn by displaying "animals of value". WHAT IS THE MILLENNIUM FUTURITY? Ben Gravett, of Catlett, Virginia, and his then ranch manager Bill Davidson, began planning for the Millennium Futurity in 1999. The idea of a Futurity itself was not that new. In fact, the idea came from the Gravetts' long background with equestrian organizations where such futurities have been held for years. In 2000, the first Millennium Futurity show took place in Culpeper, Virginia. That year the prize money totaled $10,000 with only 4 classes. G&G Longhorn calves were the first animals to be eligible for the show. The event really took hold in the next couple of years. The prize money increased to over $35,000 in 2004, the number of partners jumped to 27, the number of show classes increased, and the sale moved to Waxahachie, Texas to accommodate the growth. All of this after only a few short years! The main goal of the Millennium Futurity is to promote the Texas Longhorn by displaying "animals of value" and to have some fun in the process. The Futurity allows people to show off their best animals and have a chance to win money and prizes. It also affords everyone an opportunity to see what other breeders are producing. Any animal to be shown or sold at the Millennium Futurity must first meet the eligibility requirements. In order to be eligible, the animal must be registered with the Texas Longhorn Breeders Association of America (TLBAA) or the International Texas Longhorn Association (ITLA), and must have been owned by a Millennium Futurity partner since the date that partner joined. In addition, any offspring that an animal has after the time it becomes Futurity eligible is considered eligible. This allows people who are not partners in the Futurity to participate in the show once they've purchased an animal that is already eligible. 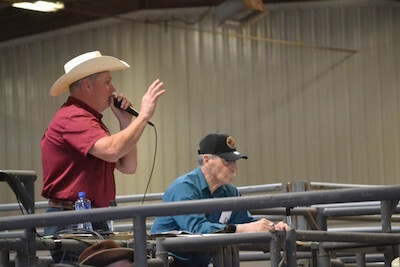 THE MILLENNIUM FUTURITY SALE IS OPEN TO ANY BUYER; YOU DO NOT HAVE TO BE A FUTURITY PARTNER IN ORDER TO BUY AN ANIMAL. (You DO, however, HAVE to be a partner in order to consign cattle to the sale.) Consignment fee for each sale animal also includes the entry fee for the Futurity Show. The animals are sold before the show, and the new owners receive any show prize money won by their new animals. In past years, about half of the show winners had been in the sale the previous day. 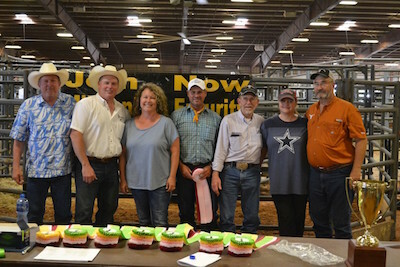 In the Futurity Show, animals are shown in their respective classes and judged by a panel of five judges who score the animals on the attributes that set the Texas Longhorn breed apart from the rest. These judges are nominated and voted on at a meeting in November by the members of the Futurity. Of the five judges, two specialize in show judging, two specialize in horn judging, and the final judge is a "wild card" judge. The high and low scores from the judges are thrown out, and the remaining three scores are averaged, with the highest score winning the class.